Melissa Terlizzi offers us this Martini Mouse sculpture for New Year’s Eve. No caption necessary other than Happy New Year! Take a moment to look at Melissa’s other whimsical and/or realistic animal kingdom on Facebook and Flickr. Don’t miss my favorite, her Box Turtle pin. Celebrate safely and come back tomorrow for a look at the PCD year in review. 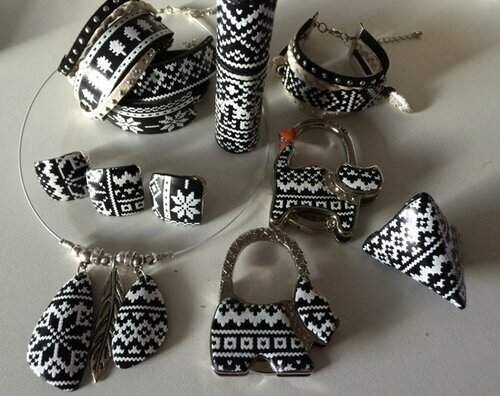 This Nordic Knit polymer perfume case from Francoise Haon (Arliane) is black and white, of course. What’s not clear is if the pattern is the result of mighty impressive canework or some other technique. Patterns as precise as this make canemakers envious. Could she have extruded the tiny components? We’ll have to wait to see if Francoise gives us a clue. Take a look at the rest of Francoise’s Nordic line on her blog, her online shop and Facebook. What’s your guess? Lindsay Locatelli (Wazodesigns) has a background in wood so carving’s not new to her and it shows on this polymer bangle. Once she gets the feel of the tool and the rhythm of the cut, she takes off! Lindsay’s latest venture is joining Artful Home where her work will appear in the Spring online catalog. More cut-ups on Facebook and Instagram. Ukraine’s Lela Todua (LelandJewelry) carves big bold polymer links and hangs them on a velvet ribbon. The dark wash of color over the red links adds a serious, aged look. You can see the necklace on a model on her Etsy listing. You’ll find more of Lela’s work on Flickr, Facebook, Pinterest, Twitter, and Instagram. She’s a very social and busy girl! A Christmas Day example of handmade heartwarming polymer from Eriko Page who shares her clear glass ornaments draped with polymer poinsettias. See more of Eriko on Facebook and enjoy your holiday. As we approach our usual end-of-year studio pare down and purge period, we might take a hint from Spain’s Tanya Mayorova and bury our beads! Tanya doodles with extruded strips of clay set on edge. Stacked against each other, the strips dip and bend and wind around an assortment of beads and baubles. They change color as they move along. The effect is like water flowing past pebbles in a stream. Do you have some beads you love and can’t let go of? This collage of treasures might be just the thing. Look closely at Tanya’s methods on Etsy, Flickr, and Facebook (and in prior PCD features).